In this section large and heavier introduces you to considerably sizable or heavy decorative accent hard to miss during guest of the family hosting events. We offer antique and vintage wedding dresses worthy of displaying at home, store, or B&B. Find here vintage tools, outdoor accessories for home and camping. Vintage sporting pieces for wall or standing decor. Checking our cast iron railroad collectible plaques, fireplace accessories, doorstops and vintage tolls including tire pumps or view wooden advertising signs for all occasions, artist's isle or beautiful vintage serving trays. Christmas tree stands to antique merchant barrels, Bali wooden carvings; antique wheelchair displayed in this section. You can personalize the current design with the addition of larger table lamps, nightstands, side table, armchairs in various styles. We provide Chinese scholar chairs, Mid-Century and Retro style decorative possibilities with items in this section. Cast Iron shoe form number 4, vintage item. Quart Pitcher in Paneled Grape Milk Glass by Westmoreland in beautiful grape and vines design. Warhammer SKAVEN ARMY games workshop for replacement and parts. The Lord of the RIngs Trivia Pursuit board game Movie Trilogy by Parker Brothers 2003. Cast iron doorstop with mixed flowers in blue basket. Heavy metal Christmas Tree stand with Christmas tree decoration in green and red color. Brumberger 8mm film storage metal case. Vintage large brass door knocker in an Art Deco design. 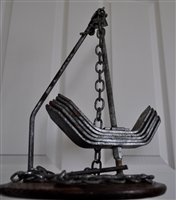 Boat anchor, heavy metal with weights and chain. Large brass duck from India, 3.8lb. Emergency foot tire pump, vintage and working. Vintage Radio Flyer Fold 2 Go Trike functional playtime, decoration, or collectible. Vintage Syroco Ornamental Wood Federal Eagle decorated mirror bobbled glass in hard plastic mold vintage wall decor. Vintage handmade Marble and Brass combination design ornate serving tray or centerpiece, 11 lb.